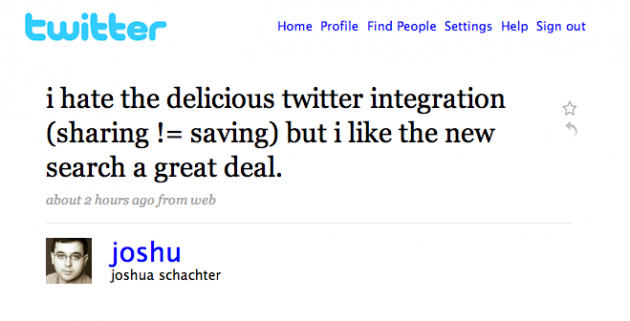 Delicious Freshens Up With Twitter. Founder Hates It. Delicious was once one of the hottest social sites on the Internet. That’s why Yahoo bought it in 2005. But it’s weird now to even think about it as a social site, I get more of the utilitarian vibe from it these days. People still use it, but it’s more of a repository. Or, to put it another way, it’s where links go to die. Contrast that with services like Twitter, Facebook and FriendFeed where people are sharing and re-sharing links all over the place, and having conversations about the content, making it feel alive. And that’s what Yahoo wants to tap into now, with another revamping of Delicious. And not surprisingly, this revamp is very Twitter-centric. 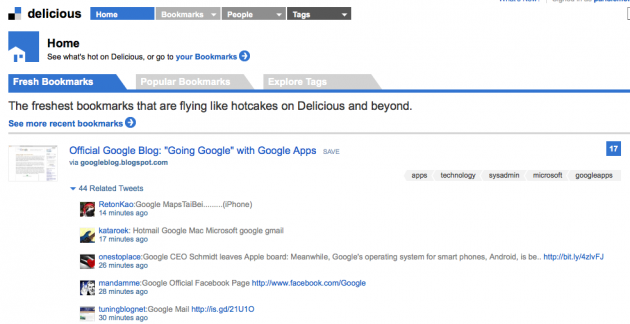 The biggest difference is that the main Delicious homepage is now an area called “Fresh Bookmarks.” Previously, the main page contained the most popular bookmarked pages on the site, but that is now relagated to the second tab. This redesign is all about freshness, which is to say real-time-ness. Delicious looks at and refreshes this list of links every minute or so based on what people are bookmarking and what they’re tweeting. This model, while flawed (I’ll get to that), does make the main page of Delicious more interesting. “Design” is the most popular tag on Delicious, according to Yahoo, and that meant a “Popular Bookmarks” area that was dominated by things like “200+ Paper Brushes For Photoshop.” For some people, that is useful, but for at least just as many, those types of links are not useful in the least bit. The redesign is an effort to move away from that. One problem I see with this Fresh Bookmarks area is that the tweets it uses in its equation, often don’t have anything to do with the content being linked to. Yahoo did this on purpose, noting that some 81% of tweets don’t contain URLs, and they still wanted to use data from the most amount of tweets to populate this area. So instead they use keywords in tweets, but this often results in tweets populated below the shared content that have absolutely nothing to do with it. And on top of this new Fresh Bookmarks area, when you bookmark things, Delicious now allows you to also tweet your links out at the same time. This should be useful to people who want to save stuff for later, but also want to let others know about it. You can also easily email links to people, and send them to your Delicious contacts. This is all done through the bookmarklet. And the search aspect of Delcious has been completely revamped as well, making it easier for power users to dig through things they’ve bookmarked in the past. The new search area also features rich content, so if someone shares a YouTube video, you can play it inline. The same is true with Flickr images. All of that is great, the problem is that it’s hard to teach an old dog new tricks. Delicious has long just been about saving links and not about sharing them like many of the new, more versatile social sharing services out there. If Yahoo wanted to tie the product into Twitter, it should have done that months ago, to get ahead of the curve, rather than at the back of it. The problem now is that there are plenty of other services people are already using to share stuff on Twitter. Most people still just paste links right into the update box, and Twitter uses Bit.ly to shorten them. This is allowing Bit.ly to collect a huge amount of data about what people are sharing — something which it could use soon to take on Digg and Delicious. And on the bookmarking side of things, the trend seems to be towards simple. Mike likes a service called Pinboard, I’ve long been a fan of Instapaper. Both require less effort to use than Delicious, and are quicker. i hate the delicious twitter integration (sharing != saving) but i like the new search a great deal. Well, at least he likes the new search, I guess.